11.05.2005 - What have we here? A regular old smelly dead rat in the attic. Typical case, the homeowner called me with a terrible odor in the house, and asked me to come out right away and find the source of this ungodly stench that no well educated middle/upper class American citizen should have to endure. "Why has this horrible fate befallen me?" the lady of the house moaned and groaned. "My delicate nose shant tolerate such an injustice of nature. It is my right to live in a fresh scented abode." Apparently it was also her right to spread rat poison in the attic. How do I know this dirty little secret? Like any expert forensic investigator, I took a good look at the clues. First of all, I saw no external wounds or any blunt force trauma. No lacerations or bullet holes either. The rat hadn't drowned or suffered 3rd degree burns. The rat's eyes appeared bloodshot - indicating internal bleeding by anticoagulant. I also noticed that the rats leavings were an odd color - they weren't the usual color of such matter (brown is the usual color in case you've never looked in a toilet before). The rat terds were actually bright blue - the exact same color as rat poison. I thought carefully about the case and eventually put two and two together. Some sicko had collected rat droppings and dipped them in 2000 Flushes concentrate, and scattered them in the attic, then electrocuted a rat, sprayed chlorine in its eyes (for redness) and placed it amongst the droppings. At least that's the explanation I had to deliver, since the homeowner swears that this terrible smell was not due to her innocent attempt to solve her rat problem herself with a block of blue Wal-Mart rat poison. 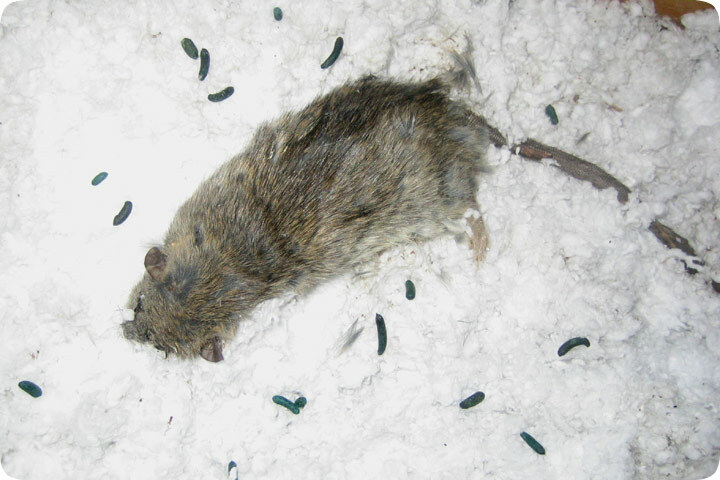 Look, people: if you're dumb enough to try to poison rats, you're going to end up with dead rats in your attic and walls, and it's going to stink. And then new rats will just come in to replace the old rats. If you read my site at all, you'll get bored with how many times I say this: DON'T POISON RATS. Unless you happen to like the aromatics, and you happen to like meeting me and paying me. In that case, by all means, do poison rats. You don't want me or your nose out of a job, do you?